Through videos, films, roundtable discussions, presentations and reports, we share information, research and stories and encourage knowledge exchange. ICHR hosts Research Rounds on a variety of northern health topics. 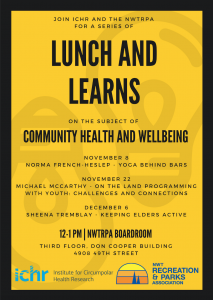 Providing an opportunity for speakers and attendees to share and collaborate on health research, programming and approaches in the north, these forums feature a casual, short presentation followed by a roundtable group discussion/Q&A, or networking time at the end. Visit our Events page or our Facebook page to get updates on weekly topics.